Some plant-eating dinosaurs apparently liked a side order of crabs to go with their usual salad. Some plant-eating dinosaurs apparently liked a side order of crabs to go with their usual salad. Scientists said on Thursday fossilized dung thought to have come from herbivorous duck-billed dinosaurs that inhabited southern Utah 75 million years ago contained pieces of crustacean shells along with vestiges of vegetation. The discovery provides the strongest evidence to date that some large herbivorous dinosaurs sometimes strayed from a purely vegetarian diet, said University of Colorado palaeontologist Karen Chin, who led the research published in the journal Scientific Reports. “This was a very exciting discovery, precisely because it was so unexpected,” Chin said. Fossilized dung, called coprolites, offers insight into the diet of extinct creatures that cannot be gleaned by merely studying teeth, jaws and skeletons. Ten coprolites from Utah’s Grand Staircase-Escalante National Monument contained crustacean shells mixed with rotted coniferous wood. 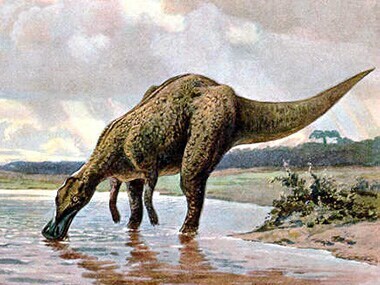 For at least part of the year these duck-billed dinosaurs may have munched on rotting logs because they contained stores of crustaceans and other invertebrates, Chin said. Chin said the researchers do not know precisely what types of crustaceans were eaten by the dinosaurs, but it was possible they were crabs. A variety of crustaceans also including crayfish and pillbugs are known to shelter in the moist environments of rotting logs. The crustaceans were at least two inches (5 cm) long. “Rotting wood and fungal tissues would have offered useful nutritional compounds such as cellulose and fibre, and the crustaceans would have provided good sources of protein and calcium. Protein is an important component of animal diets, and is particularly important when animals are breeding,” Chin said. The researchers think eating crustaceans may have been a seasonal dietary change linked to breeding and egg-laying. Some birds, the evolutionary descendants of dinosaurs, consume more protein and calcium during breeding season. Duck-billed dinosaurs, also called hadrosaurs, earned their name because the front of their skull resembles a duck’s bill. They also possessed beaks and specialised teeth for grinding plant material, and are believed to have roamed the landscape in herds. Two hadrosaurs that lived in the area at the time were: Parasaurolophus, roughly 33 feet (10 meters) long with a long tubular head crest; and Gryposaurus, about 39 feet (12 meters) long with an arched nasal crest. Hadrosaurs were common in western North America and other parts of the world during the Cretaceous Period, representing an important plant-eating group alongside armoured dinosaurs and horned dinosaurs.